Psychedelic-style wedding cake. Not everyone’s cup of tea. This wedding cake looks like one of those old-fashioned “Fab” lollies. You know the ones: they’ve got loads of “hundreds and thousands” (or “sprinkles” if you prefer) on them and they come in a very dated-looking packet. They are the kind of lolly you can imagine being unchanged since they they began being sold from ice cream vans during the 1970’s. But one thing occurs to me: how messy will it be when it gets sliced up? All those sugary bits getting scattered over the floor, dropping on plates and napkins. If you want a less messy eating experience it’s probably best to stick to the traditional iced variety (though not fruit cake of course, because nobody likes it). And if we were to use “sprinkles” as a pancake-flavouring (we make crepes at weddings, so we are always considering different new flavours) then whoever hired our mobile crepe stand for their wedding might be disappointed if the fillings were spilling out all over the floor. If there is one thing we like to see, it’s a tidily-made wedding crepe. How a guest eats them however, is a matter entirely for them. And with all the different food allergies and preferences in existence, what if someone was allergic to a particular colour of “sprinkle”? It would be a nightmare trying to find them a food-safe slice. It could take all night. Which is another reason to think deeply before opting for a cake of this type. The name of the decoration also needs a bit of discussion as well. Are they “sprinkles” or are they “hundreds and thousands”? As the comedian Sean Lock once asked: what do we call a single “hundreds and thousands”? It’s quite an interesting question, one which Buddha could have meditated on for a year or two, I’m sure. It may also be slightly misleading, as who is to say that there would be “thousands” of them on there? 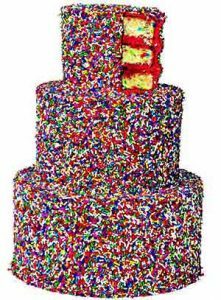 One idea is to round all the kids at the wedding up and get them to count all the sprinkles after first guessing the total number. Whoever gets nearest to the final total gets a massive slice of wedding cake – and whoever is furthest away gets a nutella crêpe.